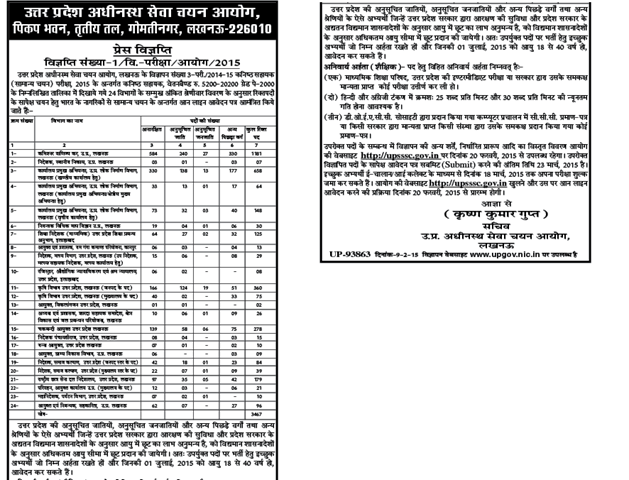 Uttar Pradesh Subordinate Service Selection Board (UPSSSB, Lucknow has released notification advertisement no. 01/2015 for 3467 posts/ vacancies of Junior Assistants on pay scale Rs. 5,200-20,200/- Grade Pay Rs. 2,000/-. The online application will be started from 20th February 2015 on the official website of Uttar Pradesh. Any form other than online application will not be accepted and application will be rejected. The last date to apply online/ closure of online registration is 23rd March 2015. Last date of Fee payment through ONLINE mode is 18th March 2015. The Final Selection of the candidate will be made based on performance in written examination and personal interview of the candidates along with document verification in which originality of candidate will be checked by the Selection Board.